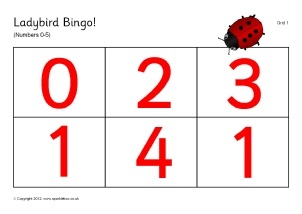 A simple bingo game designed to help with counting and recognition of numbers 0-10. 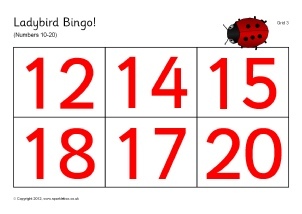 Includes 6 printable bingo boards and a set of ladybird cards where each ladybird has a different number of spots (0-10). 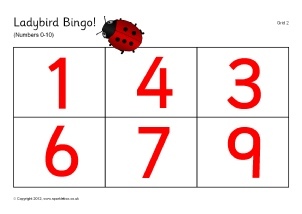 A bingo game designed to help with counting and recognition of numbers 10-20. Includes 6 printable bingo boards and a set of ladybird cards where each ladybird has a different number of spots (10-20). 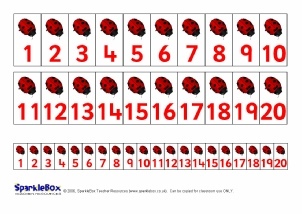 A PDF document with 3 printable ladybird number tracks. 1-10, 11-20 and a full 1-20 track. Your class will love counting with these! 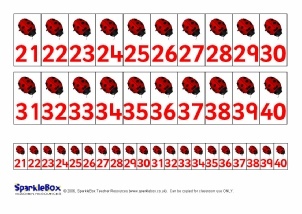 An extension set of ladybird number tracks with the numbers 21 up to 40. 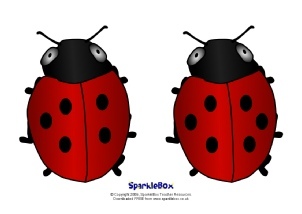 A set of ladybirds with spots from 0 up to 10. Print these out and laminate as visual aids and for all sorts of classroom activities. A set of ladybirds with spots from 11 up to 20. Print these out and laminate as visual aids and for all sorts of classroom activities.